Welcome to very first part of 'JDBC Java Tutorial Series', in this particular blog we will come across 'How to create a JDBC connection in Java' and What are 'Class.foreName() and DriverManager classes in JDBC. In today's discussion we will create a jdbc connection to MySql database using 'com.mysql.jdbc.Driver'. Lets take a look at overall project structure for today's discussion. We have added a 'my-sql-connector,jar' in lib folder to make the connection happen. Please make sure the specified jar file is added to the classpath. 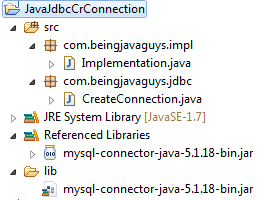 The actual code of creating jdbc connection resides under 'CreateConnection.java' class file. This is the sample database that we have used to create a connection with, execute the code below in your MySql query editor. This is a simple java class where we have loaded the driver class using Class.foreName() method and that obtained a connection with the help of DriverManager Class. A brief description of these two is given in the rest part of the tutorial. What Class.foreName() does exactly ? Class.foreName() loads the class that is being passed to it as an string argument. In our case Class.foreName("com.mysql.jdbc.Driver") loads the specified driver class into JVM, so that the class can be used while creating a connection. What if we have registered more than one driver class ? In case we have loaded more than one driver class into jvm, this would not create any issue while getting connection. The connection would use only one appropriate class in all of loaded classes. In case there are more than one appropriate driver class for the connection than, very first appropriate class in the order of they are being loaded is used in getting connection and all others will be ignored simply. What java.sql.DriverManager class does exactly ? DriverManager is a simple class that manages a set of JDBC driver classes. When getConnection() is called DriverManager attempts to locate a suitable driver for connection from all loaded driver classes. This is a simple Java class containing the execution code here so that the actual implementation can be explained. In this particular blog we came across how to create a jdbc connection in java and a brief about what is Class.foreName() and DriverManager class. In upcoming blogs we will see more about JDBC including JDBC Create Table & JDBC Inset Query & JDBC Delete and JDBC Update Implementation in Java.